When Charmaine Hammond and her husband Christopher adopted a five-year-old Chesapeake Bay retriever, they soon had their hands full. Fun-loving and affectionate, Toby could race through a house like a tornado, leaving a trail of rearranged furniture, emptied closets and broken toilet tank lids — in addition to typical canine wear-and-tear. He also suffered from separation anxiety and had a series of behavioral issues. Bringing in a a dog behaviorist set in motion a life-changing process for Toby, the Hammonds and the many lives that Toby touched as an animal-assisted therapy dog. The lessons she learned from Toby — patience, purpose, persistence, the power of unconditional acceptance and being your authentic self — inspired Charmaine to write a story, “What I Learned From the Dog,” that was published in Chicken Soup for the Soul. That led her to write a series of children’s books — Toby and His Hospital Friends and Toby Says Be a Buddy Not a Bully — that have won a Gold Mom’s Choice Award. Toby and His Hospital Friends is an engaging book about the routine of Toby’s work as a therapy dog. Although designed for children, the book never descends to the generic. Toby is a character with personality and passions, woofing a little girl’s fuzzy slippers and dozing off during story time. The situations of the children and the other patients he visits aren’t sugar-coated either. Simon gets around using a wheelchair. Sarah has to have an operation and is shy at first with Toby. Miguel is homesick for his parents and his own dog. Mrs. Smith talks about a dog she once had who looks just like Toby as she and Toby take a little walk. The illustrations by Rose Anne Prevec complement the story beautifully. Loosely rendered, richly detailed paintings are mixed in with simpler drawings that put the focus on the characters. 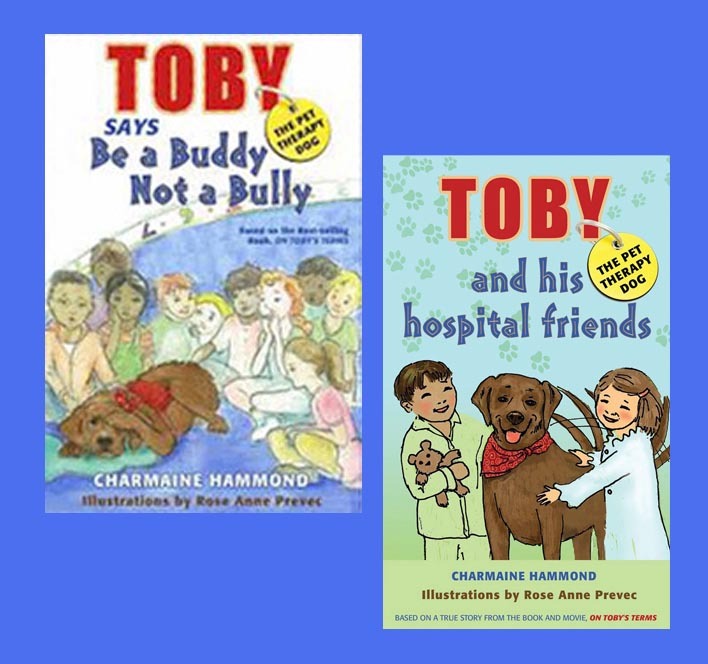 The complex topic of bullying is the theme of Hammond’s second book, Toby Says Be a Buddy, Not a Bully. In this book, Miss Charmaine takes Toby the therapy dog to visit an elementary school. She tells the children about an experience Toby had in a park with a dog who growled at him and stole his toy. The discussion about how Toby responded to this offers children ways that they might use if someone tried to bully them. It emphasizes communication and not responding to meanness with meanness. A dog’s openness and acceptance of differences provides a model for negotiating potential conflicts. Both books includes a maze game and a list of questions that children and adults can use to discuss the stories and the issues they raise in more detail. Disclaimer: Charmaine Hammond provided review copies of these two books without charge. The opinions express are the independent assessment of Ask Fido, posted without compensation or other consideration.